MEGA64 HAS CUTE CATS AND POD CASTS!! Our newest video brings you what everyone on the internet just LOVES- Nintendo games and cute cats!! All rolled up into one lil' cute snuggly funball! You will have nothing to say but "awwww" once you see this clip, brought to you by the fine folks at Nintendo! Watch our Super Mario 3D world video below or over at Youtube! Then, on top of that, we have a new podcast for you today! 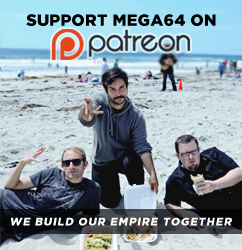 Mega64 Podcast Episode 280 is our annual "THANKSCAST" where we give praise in the highest! This year we are thankful for the Xbox One, holiday milks, Will.i.am, and much more! Watch below or get the audio version here! That's all for now- keep an eye out... Black Friday draws closer! Are you ready for us?